As the world moves increasingly towards the separation of spirituality and culture from politics, political decisions are increasingly becoming inhuman. Any decision made from the space of lack of Oneness will always propagate the problem even further, and not lead to a solution. For time immemorial, in the Vedic civilization, in ancient India enlightened masters were the state heads. They were called “Raja Rishi” (Regal Seers) and they were given the highest seat in the court because only they have the capacity to make decisions based on Oneness, without fear or greed as a motivating factor. The only motivating factor for the enlightened masters was enlightenment for all, so all socio-political decision were based only on making humans experience the highest consciousness and reach their highest potential. The ancient south Indian kingdom called Pandyas with Madurai as its capital, was one of the most culturally and spiritually advanced civilizations. It always considered its spiritual head as it political, economical and cultural head. The political rule (Arasatchi) could not be separated from the economic rule (Porulaatchi), and neither of these can be separated from the core principles of the land. The Pandyas considered Kamika Agama (scriptures on the science of living an enlightened life) written by Paramashiva (who is the original author of Yoga) as the core spiritual guide for the people and the kingdom. Thus, the political understanding of the people and the nation could only be made with someone who was a master of the Kamika Agama, who understood its principles deeply. Madurai Aadheenam Guru Maha Sannidhaanam has always been considered as the incarnation of Paramashiva. 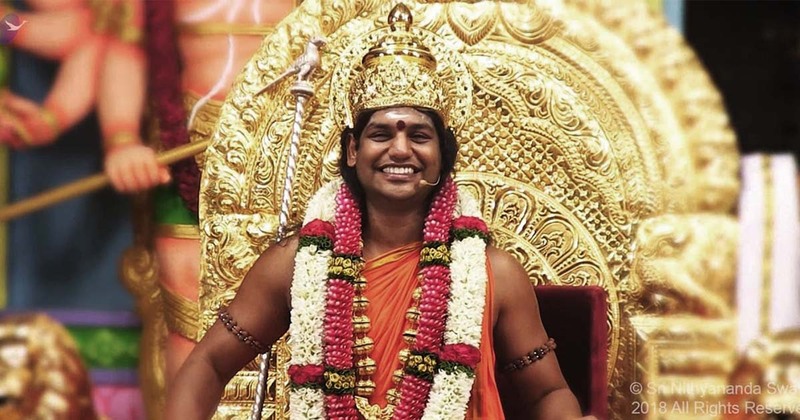 His Divine Holiness 293rd Guru Maha Sannidhaanam Sri Nithyananda Paramashivam is the 293rd successor of Paramashiva on this earth. As an Avatar of Paramashiva, he exists in the same space of Paramashiva and reveals the Agamas from the original space that created it. He is able to reveal the deep truths from the Agamas relevant to every new situation – as the world changes, He reveals new truths which continue to be relevant to this world. The Madurai Aadheenam Guru Maha Sannidhaanam was also the default political Head of State of the Pandya Kingdom, which used to be a Hindu Monarchy. 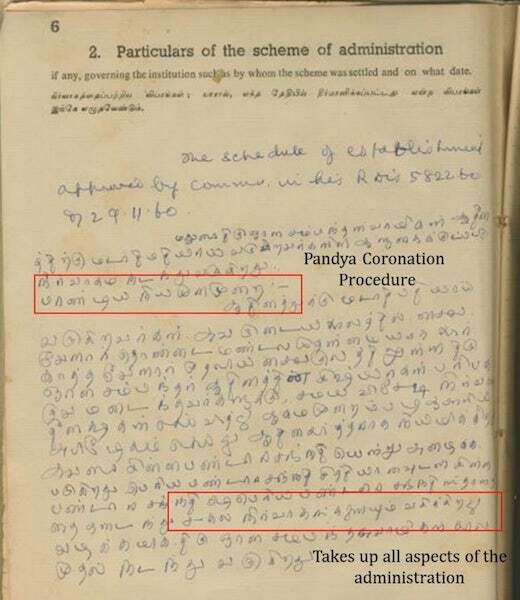 Even in its original “Document of Incorporation”, the appointment of the Guru Maha Sannidhaanam is referred to as “Pandiya niyamana murai” or the “Pandya Coronation Procedure” (Figure 1). The next Guru Maha Sannidhaanam is coronated with a ruling staff and a crown and is given the right to conduct all administration “sakala nirvagankalyum vagikkirathu” (refer to the second red box in Figure 1). One of the most famous spiritual head / rulers of Pandya kingdom is Queen Meenakshi, who is the incarnation of Devi Parashakti, the consort of Paramashiva. According to the legend, Pandya king named Malayadwaja Pandya and his wife Kanchanamalai performed a yajna (sacred fire ritual) seeking a son for succession. Instead a daughter is born who is already 3 years old and has three breasts. Paramashiva intervenes and says that the parents should treat her like a son, and when she meets her husband, she will lose the third breast. They follow the advice. The girl grows up, the king crowns her as the successor and when she meets Shiva, his words come true, she takes her true form of Meenakshi . According to some scholars, this may reflect the matrilineal traditions in South India and the regional belief that “penultimate [spiritual] powers rest with the women”, gods listen to their spouse, and that the fate of kingdoms rest with the women . But another hidden aspect of this story is the fact that the spiritual and royal heads were often the same. Both Meenakshi and her consort Sundareshwara (the incarnation of Paramashiva) are coronated as both the spiritual heads of Madurai Aadheenam and King/Queen of Pandya Kingdom. He rules for 8 months in a year, and she rules for 4. This practice was revived again during Thiru Gnanasambandar’s reign in Madurai when he revived Madurai Aadheenam and served as the spiritual head of the Aadheenam as well as the Raja Rishi – the royal saint Head of State. There are many examples in recent history where the Madurai Aadheenam was considered as a State, and the Guru Maha Sannidhaanam was considered as a Head of State. The Regency Acts are Acts of the Parliament of the United Kingdom passed at various times, to provide a regent in the event of the reigning monarch being incapacitated or a minor (under the age of 18). Prior to 1937, Regency Acts were passed only when necessary to deal with a specific situation. A regent is a person appointed to govern a state because the monarch is a minor, is absent or is incapacitated. When 289th Pontiff of Madurai Adheenam left his body in 1904, His successor was only 11 years old. The British Empire, who were the rules of India at this time, invoked the Regency Act, normally used for Kings, in this situation. At the time of British rule, the age when a child became a major was 12. So, 1904 the British invoked the Regency Act to take the 11 year-old pontiff under their protection. Then, in 1905, when the child turned 12 and became a major, His coronation was performed by the District Judge of the Government, and the kingdom of Madurai was handed back to the Pontiff. This story is narrated in Figure 2 in an extract from the book on Madurai history. This clearly proves that British Empire respected the Pontiff of Madurai Adheenam as reigning monarch of the Pandya Kingdom. Typically, people who are Heads of State are granted what is called a “functional immunity”. For example, the Queen of Britain, the President of the United States and other world leaders are immune from prosecution when they are in office. One such recognition was given by the British Government to the Guru Maha Sannidhaanam of Madurai Aadheenam. According to the Judicial Department Proceedings of Madras Government, in Order dated 15th September 1880, No. 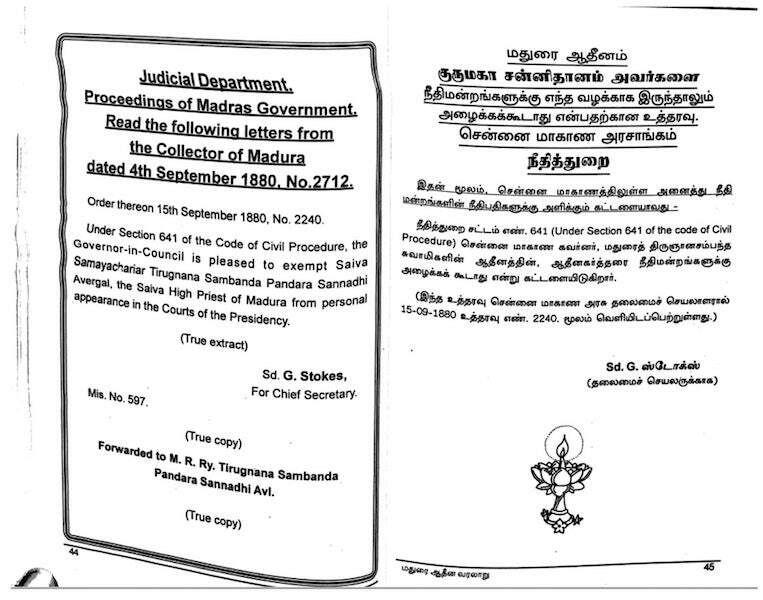 2240, it says “Under Section 641 of the Code of Civil Procedure, the Governor-in-Council is pleased to exempt Saiva Samayachariar Tirugnana Sambanda Pandara Sannadhi Avergal, the Saiva High Priest of Madura from personal appearance in the Courts of the Presidency”. This is signed by G. Stokes for Chief Secretary (see Figure 3). This shows that head of the Madurai Aadheenam is also recognized as the head of the State and is not subject to prosecution, or appearance in front of a court. Rao Bahadur, abbreviated R.B., was a title of honor bestowed during British rule in India mainly to Head of States (Kings, Governor). Translated, Rao means “prince”, and Bahadur means “brave” or “most honorable”. 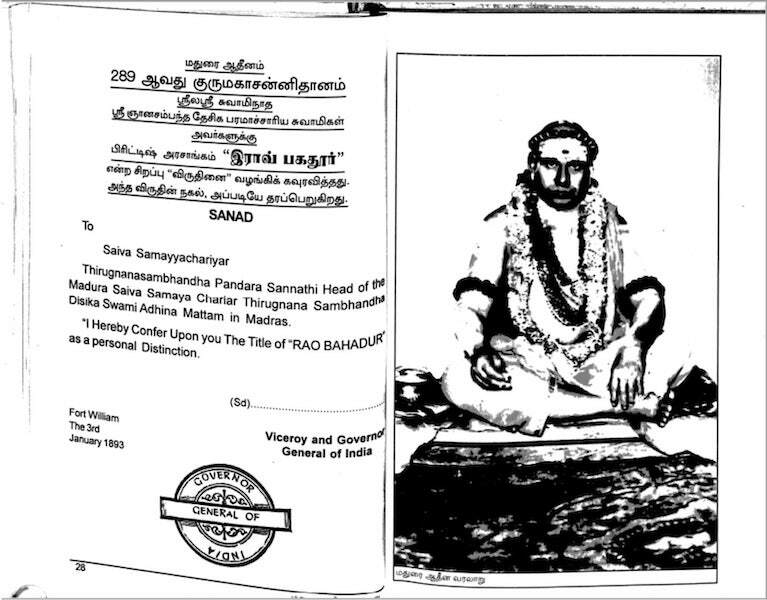 The picture (Figure 4) shows Rao Bahadur title, which is conferred only to Rulers of the Kingdom, being conferred to 289th Pontiff of Madurai Aadheenam thereby confirming the fact that Pontiffs of Madurai Aadheenam were respected, treated and revered as Rulers of the Kingdom of Madurai even during British Rule. The British also accorded the head of Madurai Aadheenam protection equivalent to a Head of State while traveling to other states and back. This is shown in Figure 5 in an extract of ruling in 1827 granted by R. Peter, the Magistrate. This clearly states that while the head of Madurai Aadheenam travels to Salem and Coimbatore he is accorded complete protection. Hence, there is no question that for the entirety of history – from Meenakshi’s rule to the British government – governments held and treated the Madurai Aadheenam as the Head of State, and granted him/her all the status, rights, immunity, honor and protection as a Head of State. Figure 5. 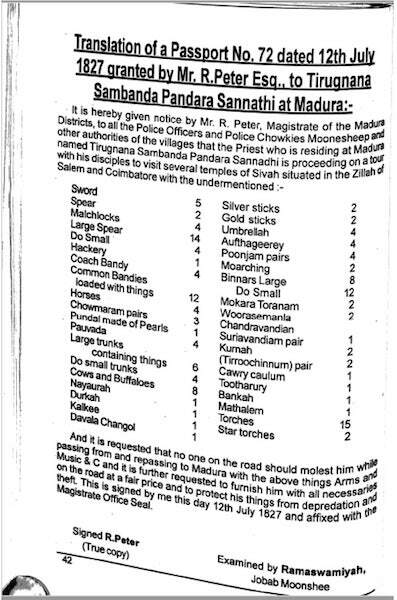 British government offering the head of Madurai Aadheenam immunity and protection as a Head of State while traveling. Harman, William P. (1992), The sacred marriage of a Hindu goddess, Delhi: Indiana University Press, ISBN 978-1-59884-655-3. “Madurai Aadheena Varalaru” (History of Madurai Aadheenam) in Tamil, Published by Madurai Aadheenam Publications, May 11, 2007. Registration Document for Madurai Aadheenam with HR&CE.